Acacia Crossing is a small, family-oriented community containing 740 homes. 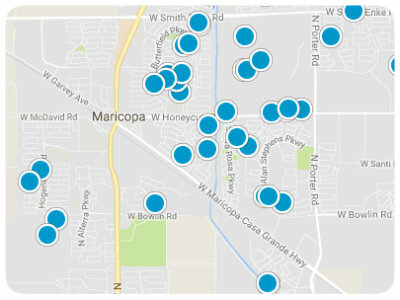 This subdivision is located in the intersection of Highway 347 and Highway 238, in southwest Maricopa. 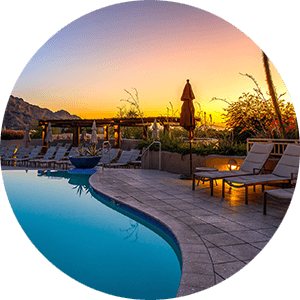 The community lies closest to the East Valley and Phoenix, just a few miles away from the Southern Dunes Golf Course. 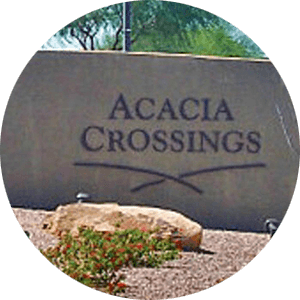 Acacia Crossings subdivision houses mid-priced single family homes, ranging from 1000-3000 square feet. It is very close to main shopping and dining areas, located right behind Basha’s grocery store. 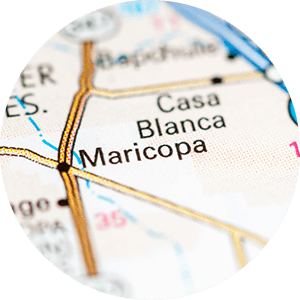 Within the Acacia Crossings community is Butterfield Elementary School (K-5), Maricopa Wells Middle School (6-8), and Maricopa High School (9-12). There are no community pools or golf courses in the subdivision, but there are many parks, playgrounds, and quick access to the big city!